Mrs. Edna Earl Vaughan Woods departed from this walk of life on November 24, 2018 at Pine Meadows Healthcare & Rehabilitation Center in Bolivar, Tennessee. Her life’s journey began ninety eight years ago on October 14, 1920, Egypt, Mississippi, the daughter of the late Mr. William Sr. and Mrs. Henrietta Bean Vaughan. Her funeral service was held on Saturday December 1, 2018 at 1:00 pm at Old Bethel MB Church with Pastor Charlie C Boyle in charge. Burial will be in the Matthews-Woods Cemetery with Dixie Funeral Home www.dixiefuneralhome.com in charge of the professional service. 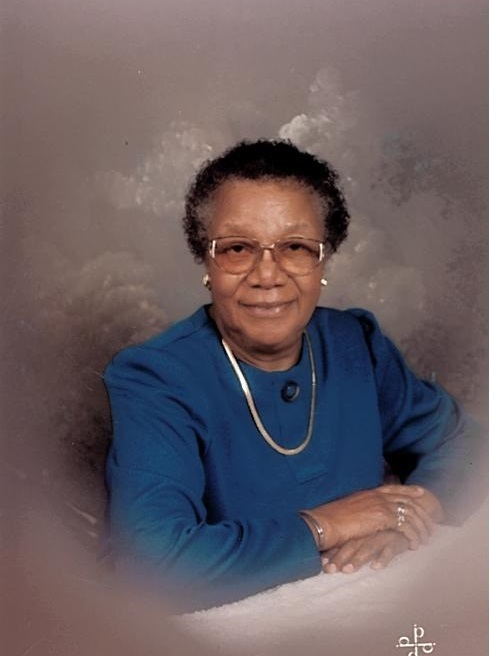 She was preceded in death by her husband Mr. David S. Woods, Sr., two sons, David S. Woods, Jr. and Leslie R. Vaughan, one brother, William Vaughan, Jr.
Mrs. Woods was a faithful, loyal member of Old Bethel Missionary Baptist Church until her illness. She served on the Mother Board, Usher Board, she taught the Intermediate Sunday School class. She was a member of the Women’s’ Missionary Ministry, served as Secretary, Secretary of the Cemetery Committee. She served wherever she was needed. One of her favorite scriptures was the 23rd Psalm which describes God as her shepherd, in the role of provider and protector—A healing prayer—She says through meditation she could feel the message of hope, love, and healing that it contains. She always taught to do good—“Do unto others as you would have them do unto you.” She never saw “bad” in a person. Everyone she came into contact she tried to teach good and kind to others. Mrs. Woods was a member of the Eastern Star Greenwood Chapter #217 and the Aluzza Temple Court #63, Daughter of Isis, which she served in many capacities. She was a life time member of the Hardeman County NAACP organization where she was recognized as the “First Gold Card Member” in November 2007, she served on the Executive Board and in many capacities. Mrs. Woods believed in education—she liked to read and encourage her children and everyone who came into contact with her to read and work hard to further their education She taught Reading at the Hardeman County Literacy Council for many years. She taught sewing classes for the Hardeman County Agricultural Extension Agency. She was a volunteer for the 4-H Club of West Tennessee where she received several awards from the Pearl Clover Division. She was also a Quilting Presenter at the Heritage Festival & Antique Auction at the UT Ag Research & Education Center at Ames Plantation, Grand Junction, Tennessee for several years. On November 3, 1946, Mrs. Woods married Mr. David S. Woods, Sr., until he departed this earth on July 20, 2000, being married for 54 years. AZ, Mr. Delvin Woods, Nashville, TN; Ms. Samantha Lee, Alexandria, VA, and Mr. James Yarbrough, San Diego, CA. Three great-great grandchildren, Ms. Toribio Armour, Jackson, TN; Mr. James & Mr. Devin Lee, Alexandria, VA; God-daughter, Mrs. Detra (Ron) Moore, Collierville, TN; Nieces are Mrs. Shirley Ruth (Willie) Greer, Jackson, TN; Mrs. Peggy Sue (Morris) Shanks, Muskegon, MI; Ms. Judy Fleming, Memphis, TN; Mrs. Patsy Sherdon, Cleveland, OH; Ms. Francis Kirby; Mrs. Helen Vaughn-Mitchell (Jesse), Kankakee, IL; Mrs. Fannie Sain, Bolivar, TN; Ms. Diane Awalt, Jackson, TN; Mrs. Barbie Ray Reed, Bolivar, TN; a very devoted daughter-in-law, Mrs. Carolyn S. Vaughan, Bolivar, TN; two very special friends, Mrs. Shirley Mitchell and Mrs. Fair Ruth McCllean, Bolivar, TN; other relatives and friends.